Point Pleasant junior Jacob Muncy maintains leverage on an East Fairmont opponent during a 285-pound match Wednesday at Point Pleasant High School in Point Pleasant, W.Va.
Point Pleasant senior Isaac Short locks in a hold on an East Fairmont opponent during a 106-pound match Wednesday at Point Pleasant High School in Point Pleasant, W.Va.
POINT PLEASANT, W.Va. — Not exactly the expected statement. 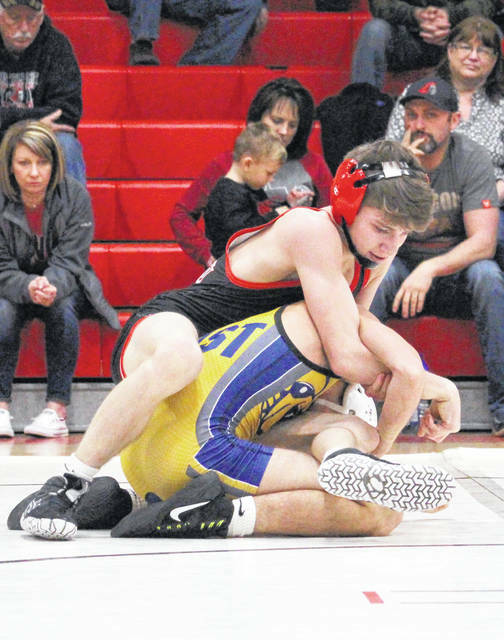 The Point Pleasant wrestling team — the top-ranked Class AA program in West Virginia — produced a 32-10 record individually and doubled-up all three of its state-ranked opponents on Wednesday night en route to three wins during a quad match at The Dungeon in Mason County. The host Big Blacks posted sizable victories over Wirt County (66-12) and Clay County (66-15) — the second and 10th ranked teams in Class A — in the opening and finishing bouts of the night. The middle round, however, pitted the Red and Black against East Fairmont — the second ranked team in Class AA and a legitimate contender for this year’s state crown. PPHS went just 3-2 through the first five lightweight divisions, but the hosts ultimately went on to win six of the last nine contests while claiming a 45-22 triumph. Overall, the Big Blacks had 19 pinfall wins, two technical falls and a pair of major decision wins — as well as six wins by forfeit. 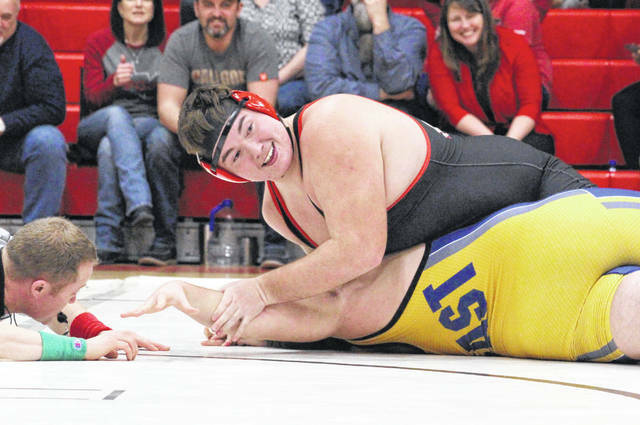 East Fairmont was the only team that Point Pleasant did not earn double-digit wins against over the course of 14 divisional bouts. That 9-5 record followed a 12-2 margin against Wirt County and preceded an 11-3 count against Clay County. The Big Blacks had 10 grapplers go unbeaten by night’s end, half of which posted perfect records against all three opponents. Most would agree that it was pretty good night for the home team, and PPHS coach John Bonecutter certainly acknowledged that it was just that. However, after winning the Fandetti-Richardson Brawl and WSAZ Invitational over the past two weekends, the 10th year mentor was expecting a little more from his troops — especially a group with aspirations of bringing home this season’s AA championship. “We faced three state-ranked programs tonight, so it’s not like we wrestled any slouches this evening,” Bonecutter said with a small chuckle. “But to be honest with you, I thought we were a little flat tonight. I thought that we didn’t wrestle particularly well in spots. We had bright spots too, but we need to stay hungry and clean it up a little bit. Derek Raike (120-126), Mitchell Freeman (138-145), Wyatt Wilson (145-152), Juan Marquez (182) and Jacob Muncy (285) all went 3-0 in their respective weight classes. Freeman and Muncy each landed three pinfall wins, while Raike and Marquez scored two pinfalls apiece. Wilson also had a single pinfall to his credit. Raike also won by technical fall (22-4) against WCHS at 120 pounds. Isaac Short (106) and Wyatt Stanley (220) both went 2-0, with Stanley notching a pinfall and Short landing a major decision (10-2) against Wirt County. Parker Henderson (120) and Mackandle Freeman (106) both scored a pinfall in their only bouts, and Justin Bartee (132) also went 1-0 in a single contest. Christopher Smith (113), George Smith (132-138), Logan Southall (160) and Nazar Abbas (170) all went 2-1 in their respective weight classes, with Southall posting two pinfall wins and both Smiths added a pinfall apiece. Southall was the only Point grappler that went 2-1 overall to win his match against East Fairmont. Abbas had a 17-2 technical fall against WCHS, while George Smith had a 14-3 major decision against the Tigers. Zac Samson (152) and Nick Ball (195) both went 1-1 overall and had a pinfall each. Oliver Skeie (182) and Dakota Moses (220) went winless in a match apiece. The Big Blacks return to action Wednesday when they travel to Parkersburg High School for a dual match with Big Reds at 5 p.m.